Environmental Landscape Supervisor Patrick Wegeng and Planting Coordinator Lois Barb review newly cleared area for future plantings. If you walk or bike to Ballston Metro from the south-west, chances are you use the trail that cuts thru parkland from the intersection of George Mason Drive/Wilson Boulevard to the Fairfax Drive/I 66 exit. Did y0u wonder why 100 white pin flags suddenly appeared throughout the grounds? The Bluemont Junction Trail’s Green Corridor Initiative is creating habitat for songbirds, butterflies, and other wildlife over the next year. For the last two months, crews from Arlington County’s Parks and Natural Resources Division have cleared away the choking vines that killed the small trees and shrubs on the outskirts of the trail, and are now replanting with a wide variety of plants. If you walk the trail now, you’ll see newly planted witch hazel, dogwood, serviceberry, redbud, fringe tree, black gum, viburnums, and many more. Since the white pin flags are still by many plants, you can answer your own question as to what they are. 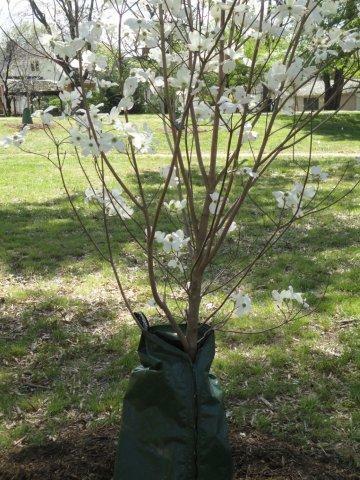 Also note the presence of water bags to get the young trees through our summer. Look for new plantings in the fall. If you have questions, contact the Planting Supervisors Lois Barb at 703-228-7980. 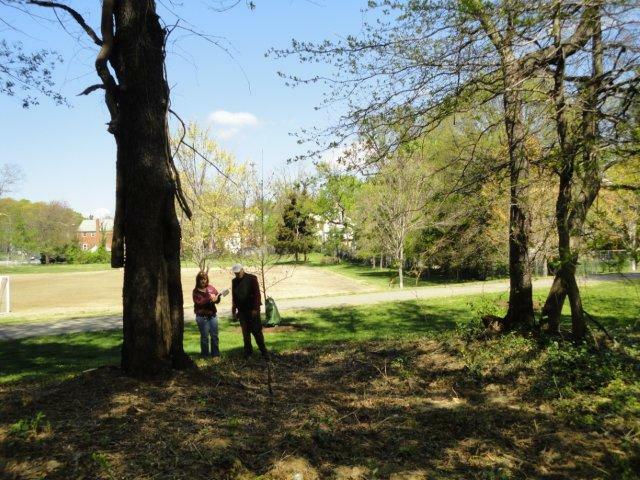 This entry was posted in Education, Uncategorized and tagged Arlington, planting, wildlife. Bookmark the permalink.